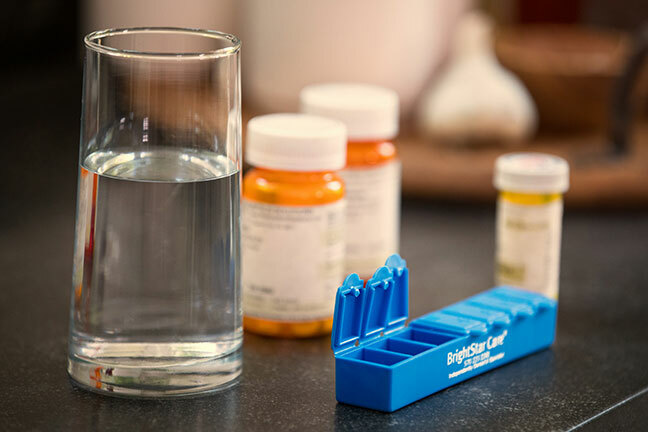 Medication Management Tips for Boulder-Broomfield Seniors | BrightStar Care " "
As a Boulder-Broomfield senior parent ages and his or her body starts to slow and break down, the need for prescription medicines will likely increase. Keeping track of multiple medicines and all that comes with that (dose amounts and times, side effects, contraindications, interactions, etc.) takes significant time and effort. The stakes are also high: improperly taking medications can have serious consequences for anyone’s health, but especially for a senior. To stay safe, read our recommendations below and know that it never hurts to enlist some help. Organizing medicines in a pill dispenser lessens confusion and creates easy access. Choose a dispenser with large font and sturdy design—the last thing you want is for your Boulder-Broomfield senior parent to have to fumble with lids and spill pills across the floor. Even with a pill box, you may want to retain original bottles and leaflets somewhere safe for your records. There are also services that sort pills into individual, labelled packets according to the time of day pills are meant to be taken and ship them to your door each month. Pill reminders help ensure a Boulder-Broomfield senior parent never misses or doubles a dose. They come in a variety of formats, such as telephone reminder services and specialized alarm clocks. There are also a slew of apps you can download to your parent’s smartphone if he or she has one (as well as your own for safe measure). Boulder-Broomfield seniors with Alzheimer’s or another form of dementia or cognitive impairment should not be allowed to take their medication on their own. The danger of missing a dose, confusing pills, or even overdosing is too high. In these cases, an in-home caregiver or family member should oversee medication management. Also know that some medicines may create side effects that mimic cognitive impairment—another good reason to keep a list of medicines current.